A perfect test for my new Nikkor lens; the AF-S Nikkor 24-70mm F/2.8G ED since you ask…I haven’t named it though… I refer to it as the ‘wider angle, wide open lens’. The speed of the silent wave motor and of course the silence of it is impressive. I see a real difference in colour rendition with the ED glass optics (In short, the coating corrects the direction of the rogue light beams; in long, click the link where they use the lovely term ‘chromatic aberration’ which rolls off the tongue and makes you sound really smart). 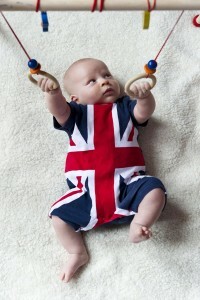 My choice of subjects for my test needed colour and unpredictable movement so the arrival of Fraser in his Olympic/Jubilee romper suit was the obvious choice. I’ll do my best not to make him my only choice of subject ever from now on. I’ll limit his appearances just to when he gets so cute I want to burst.